As a dancer with the ultra-prestigious Manhattan Ballet Company, nineteen-year-old Hannah Ward juggles intense rehearsals, dazzling performances and complicated backstage relationships. Up until now, Hannah has happily devoted her entire life to ballet. But when she meets a handsome musician named Jacob, Hannah's universe begins to change, and she must decide if she wants to compete against the other "bunheads" in the company for a star soloist spot or strike out on her own in the real world. Does she dare give up the gilded confines of the ballet for the freedoms of everyday life? Since I was a little girl I’ve been drawn to everything that has to do with ballerinas. With their pretty dresses and make up. But I never wanted to be one I just wanted to know what happens behind stage. 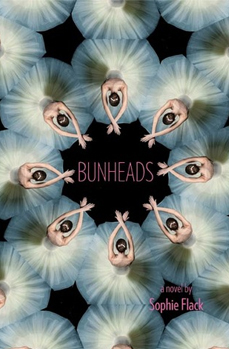 If you are like me, fascinated with ballerinas then “Bunheads” is the book for you. I definitely felt that the author knew what she was talking about since she was a ballerina herself. Let me tell you that is not as pretty as it seems. I knew that being a ballerina wasn’t easy but those? girls have to work their butts off to get somewhere in this business. It’s kind of a cruel world. I wouldn’t want to be part of it myself. That doesn’t mean “Bunheads” was a bad book but the contrary I really enjoyed reading it. It was an eye opener. Nothing comes without hard work. Hannah was a different kind of character. She was naïve and a bit shallow. Well almost all the ballerinas were shallow. I didn’t feel like they had each other’s backs. They were just too competitive. Maybe it’s not as bad in real life but it still makes me sad. Brilliant! At first I didn’t notice it was a bunch of ballerinas in formation so, I was a little confused but when I saw them I was blown away. It’s not a cover you see and you fall in love with it instantly but you have to keep looking at it and you’ll see the beauty in it.